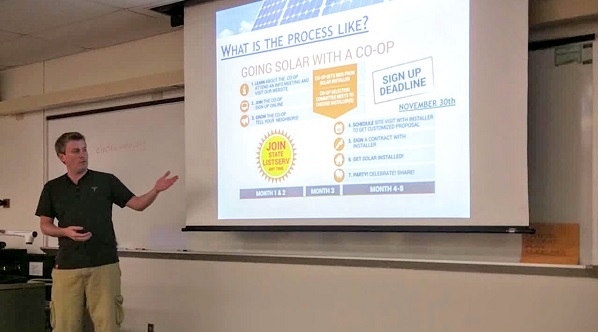 Neighbors in Sarasota County have formed a solar co-op to save money and make going solar easier, while building a network of solar supporters The group is seeking members and will host an information meeting June 5 at the Selby Public Library (details below) to educate the community about solar and the co-op process. Sarasota County residents interested in joining the co-op can sign up at the co-op web page. Joining the co-op is not a commitment to purchase panels. Once the group is large enough, Solar United Neighbors will help the co-op solicit competitive bids from area solar installers. The League of Women Voters of Sarasota County, Sierra Club, City of Sarasota, Sarasota County Council of Neighborhood Associations, Peace Education and Action Center, Florida House Institute, Mote Marine Laboratory, and the Unitarian Universalist Church of Sarasota are sponsoring the solar co-op.